Heat oven to 425°F. 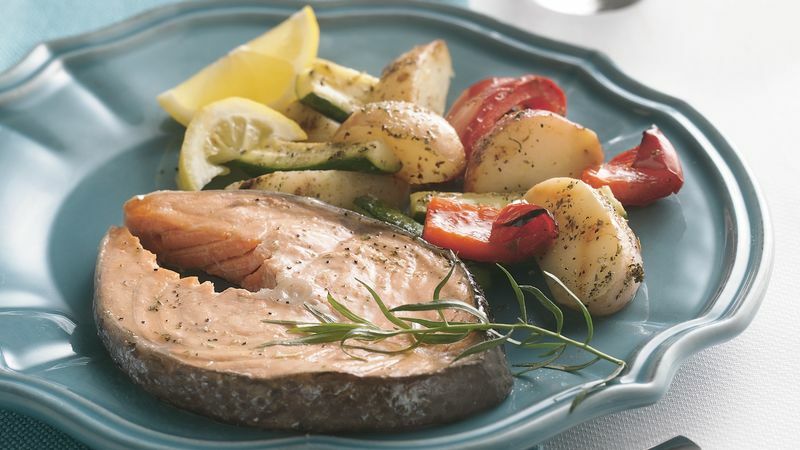 Place salmon steaks in ungreased 15x10x1-inch pan. Arrange potato wedges, zucchini and bell pepper around salmon. Brush salmon with lemon juice. Brush salmon and vegetables with butter; sprinkle with salt, tarragon and pepper. Bake 25 to 35 minutes or until salmon flakes easily with fork and vegetables are tender. Unpeeled small red potatoes can be used in place of the refrigerated potato wedges in this recipe; just cut them into wedges. If you like garlic flavor, use 1/2 teaspoon garlic salt instead of the regular salt.